That peaceful land, that beautiful land, that far-off home of solitude and soft idleness, and repose, and dreams, where life is one long slumberous Sabbath, the climate one long summer day, and the good that die experience no change, for they but fall asleep in one heaven and wake up in another. The Cool Pacific winds that keep Hawaii pleasantly mild all year around, the thrilling scenery, the native people's great friendliness toward tourists are what attract millions of tourists to the Aloha State each year. 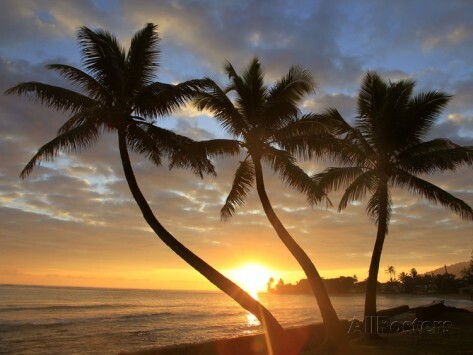 For those of you who would like to bring the beauty of Hawaii to your walls, we offer scenic and travel posters, as well as some beautiful wall murals. In addition to scenic and travel ad posters are Hawaii State Flag posters, Maps of Hawaii, and posters focusing on Honolulu, Kauai, Maui, Oahu, Volcano State Park and Waikiki Beach.